Why is a Honda 500 back in the market after all these years? NI: After environmental regulations saw an end to the old CB500 ten years ago, there was a growing gap in the market between learner bikes and 600s. We conceived this project three years ago. The new 500cc range is specifically aimed at the A2 licence category and designed to comply with its power and weight regulations. The new CB is a special model for us and we think it will reinvigorate the market; between the three variants we are projecting six-figure sales worldwide. From a design perspective, what is the philosophy of the new bikes? 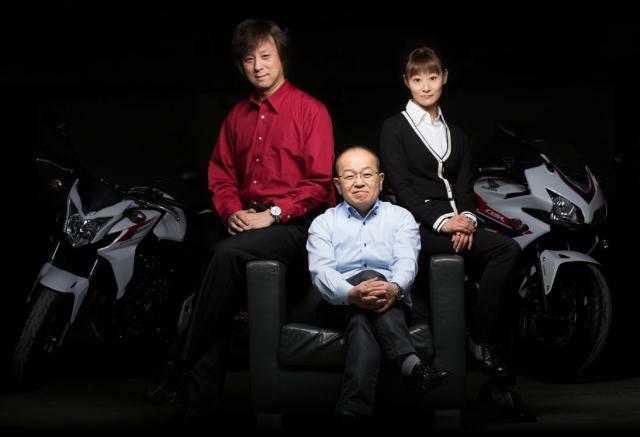 KK: They are clean-sheet designs with their own distinctive identity, but still recognisable as younger brothers of bigger Hondas – the CB500F reminds you of the CB1000R and the CBR500R has touches of the Fireblade. But these are slim, light, agile bikes, to suit the target market. The new DOHC engine has design cues from the CB450 of the late 1960s. We chose to keep the engine visible and not cover it up; the CBR500R’s fairing is like a box with one side missing. As for the CB500F, we visually separated the tank and cowls using black plastics, to give it a modern and slightly aggressive look. Ergonomically, how did you create an unintimidating bike? KI: As the three bikes will be sold across Europe, the US and Asia, it was important to ensure that the ergonomics suit riders in all these regions. It is a challenge to design a bike for an average rider size across such diverse markets, but we believe we have succeeded in making these new bikes friendly in terms of the riding position: the seat height is low and the handlebars and footpegs comfortably placed. Keenly priced, A2-compliant and plugging a gap in the UK market - would you say you have a winner on your hands? SH: There's been a lot of interest in these bikes and we know a lot of people are waiting for them to arrive in dealerships. We're expecting to sell 1,000-1,200 bikes (between all three models) by the end of 2013. Initially we're bringing in 400 each of the R (available from March) and the X (from May), and 250 of the F (from March). Of course, there are some unknowns: we're recreating a category that used to be popular but has been vacant for a while, and the A2 licencing system has just been introduced so we need to see how it takes off. But we have high hopes for the three 500s; we expect them to be as popular as the NC700 family, which has sold over 1,350 units in the last year.